Browse the full collection of material on Classical Genetics at the ESP web site. 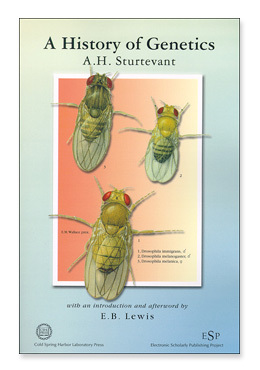 Thirty-five years after it was first published, this classic history of genetics, by Alfred H. Sturtevant, is now back in print. Biographical Memoir - A short biography of Sturtevant, first published in the Dictionary of Scientific Biography, 13:133-138, and now made available in PDF form by the National Academy Press. Lefalophodon - Another short blurb, this one at a site that emphasizes the history of evolutionary biology. Sturtevants on the Web - Reed Sturtevant, grandson of A. H. Sturtevant, has created a short page with information about Alfred H. Sturtevant (and some other members of the family). Sturtevant's Papers - The collection of Alfred H. Sturtevant papers is maintained in the archives collections of the California Institute of Technology. The full text of the book is available on-line, in PDF format. Edward. B. Lewis received the B.A. degree from the University of Minnesota in 1939 and the Ph.D. from the California Institute of Technology in 1942, where he studied under A. H. Sturtevant. Dr. Lewis received the 1995 Nobel Prize in Medicine for his discoveries concerning "the genetic control of early embryonic development".